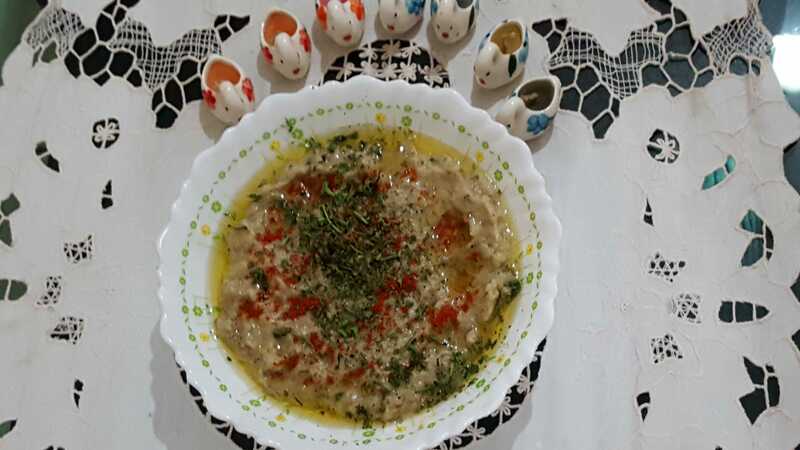 Baba ganoush is a vegan middle eastern delicious and healthy starter or appetizer made with brinjal tahini and other super healthy ingredients. Baba ghanoush is simple to make with five ingredients. Brinjal rost with open fire or use oven. Stab brinjal with a fork all around greasing with oil and put on a baking sheet, cook brinjal at 400degrees for 1 hour or till it soft. When brinjal is ready, cool it, take off the top and peel away the skin, add the brinjal a food processor or mixing bowl. Add tahini, lemon juice, roasted garlic, paprika, cumin seeds powder and salt mash with a masher or blend together until smooth. Transfer to serving bowl, and drizzle with olive oil and garnish with parsley or coriander leaf. SERVE and eat Baba ghanoush with chips, carrot, cucumber fingers and pita bread.